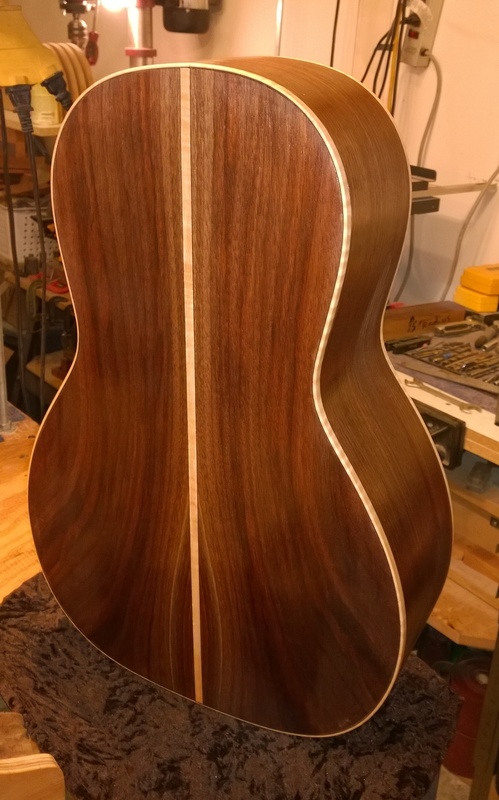 I am excited to document this parlor guitar build largely due to the fact that I have owned the tone wood being used for a very long time and have been watering at the mouth to build with for a long time, it just had to be the right guitar. After tap toning my way through several back and side sets, and then also several guitar tops to get a good match tonally, the choice became clear. I chose Black Walnut for the back and sides and Curly Mahogany for the top. In general, our aim is to make a small body acoustic guitar with volume and a warm low end push to go with the general "highs" of a parlor guitar. 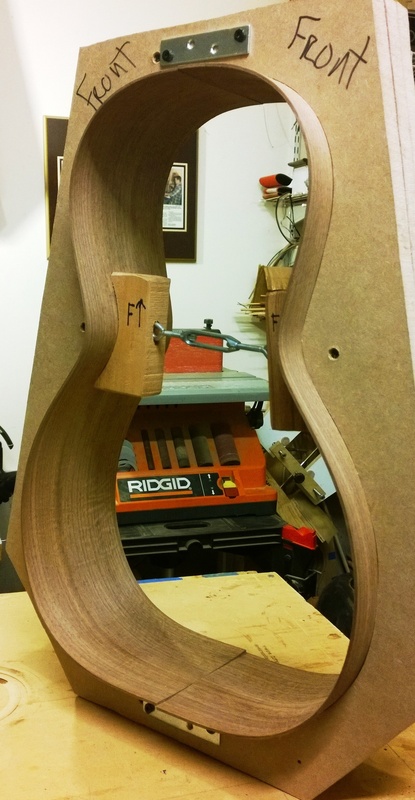 it will be built to the shape of a 1904 Martin Parlor Guitar and joins to the guitar body at the 12th fret. Our exclusive bracing system, the quality tone wood and our building practices are what will make it a genuine Hawkins Guitar. ...came from a luthier friend of mine about 15 years ago. He bought a truckload of the wood from the widow of a woodworker who had labeled it as being cut in 1970. He was generous enough to let go of a couple of really nice sets and having air dried for 45 years the wood is perfect to build with. The tap tone is deep and has surprising sustain. The color and grain figure is worth a stare at for sure. The Curly Mahogany Top is something that I picked up from my good friend Steve at Colonial Tonewoods. I have had it for about 10 years and was stoked when it matched so well with the Walnut both visually and tonally as the reds in the walnut will "pop" from the red mahogany top, and the sound match is excellent. The curl under a good finish is the icing on the cake. As Mahogany goes it is always a good choice for a guitar neck as it almost always sounds good when the guitar is properly built. The bridge will be rosewood as well as the fret-board and the head-plate. Once we glued the top and back plates to the body and completed the box we were able to tap on the top and listen and were not at all disappointed with the ring that this body has. Surprisingly deep with more of a bigger body sound, I expect that this guitar is going to have the punch of a great parlor guitar but with a low end that you won't usually find in small guitars. Up next.....Curly Maple Binding, Finishing the body, bridge and Pick Guard and then hand carving the neck so stay tuned! After routing the body for the curly maple binding, and then installing the binding, I really began to get a hint of just how eye popping this guitar is going to turn out. The darker body woods with the light maple binding just makes me want to sit and stare at it. I complimented the binding with black and white purfling adding a nice touch. For the fretboard binding I am using a very high figure (curly) German Maple that will really "pop" under a finish and polished. The fret board markers are Mother of Pearl dots with a Parlor Mustache on the 9th fret. The fret board side markers are silver rings with a mother of pearl dot in the center....nice looking and very easy to see (in real life). When I get this close to finishing a guitar build I find it hard to do anything else until I get it strung up....once I hear it I can rest a little easy and this one did not disappoint me in any way, shape or form! The small body "Parlor" sound is loud and clear with a low end that I still can't believe. As my wife put it...."It sounds like a warm ukulele with allot of bass". Personally, I could not imagine it sounding any better than it does. 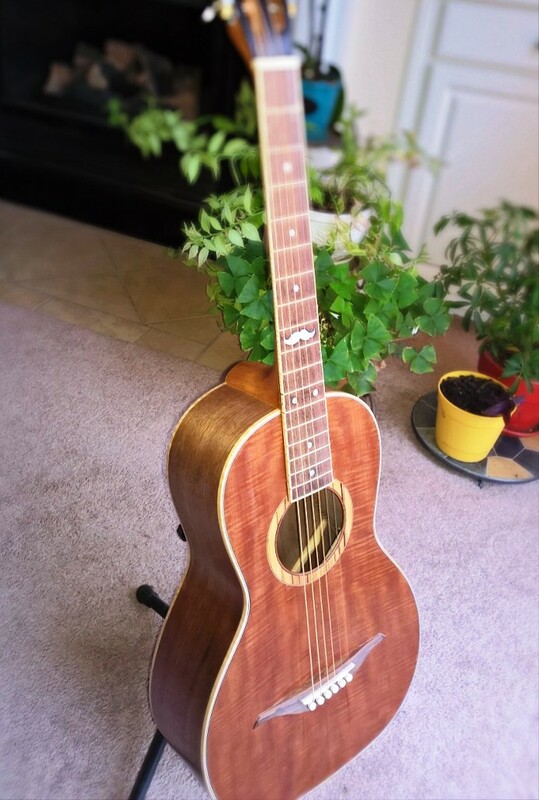 It is articulate, loud and has all the clarity and low end that you could ever want in a Parlor Guitar all with sustain that won't quit......Up Next.....take it apart, shoot the finish and then secretly hope it doesn't sell so that I can keep it! Both for sound and in keeping with the vintage vibe I decided to hand rub and polish a semi-gloss shellac finish! Check out Mike Hodges as well as Daniel Rosenfarb in these two videos. These videos were made before the finish was put on the guitar. Up Next......Finish the guitar, tweek the setup and then figure out how I am NOT suppose to keep this one! !